Motor vehicle accidents exact a tremendous toll, taking innocent lives and leaving victims with devastating injuries. In 2015, car accidents contributed to the loss of more than 35,000 lives and millions of injuries nationwide, as reported by the Insurance Institute for Highway Safety. When you are injured by the actions of a negligent driver, you need staunch legal representation by attorneys who can evaluate and build a successful case for compensation regardless of the type of accident in which you were involved. 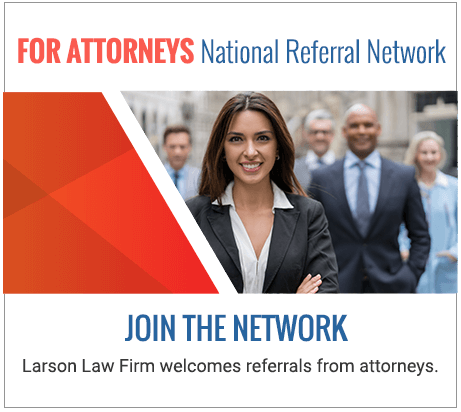 The experienced North Dakota car accident attorneys at Larson Law Firm P.C. have been helping car accident victims for more than three decades. With a dedication to justice, we use our resources and skill to obtain compensation for car accident victims. Head-on collisions. Head-on collisions can cause the most serious injuries of any type of car accident because they usually involve two rapidly moving vehicles impacting each other. Many head-on collisions occur on rural roads and might be caused by a driver attempting to pass another vehicle and crashing into an oncoming car or truck. Rear-end collisions. Traffic congestion and bumper-to-bumper traffic with vehicles traveling at slower speeds does not mean that you are safe from being involved in a rear-end collision. Being hit in the rear by a truck or another car can cause whiplash and other types of serious neck, back and spinal cord injuries. T-bone crashes. Side-impact collisions are usually associated with intersections. They happen when a car in an intersection is hit by another vehicle entering the intersection at or close to the same time. Depending upon the speed of the vehicles as they collide, the impact may cause occupants to strike their head and other parts of their body on the car’s windows and frame. Concussions and other forms of head trauma often result from such accidents. Sideswipe accidents. Cars traveling adjacent to each other, as in the case of vehicles in separate lanes on a divided highway going in the same direction, may hit into each other if one or both of the vehicles attempt to move into the other lane. The collision can cause either or both of the cars to go out of control and crash into other vehicles or into stationary objects. Rollover accidents. Some vehicles, particularly SUVs, may not handle well at high speeds or if a driver causes the vehicle to alter course too quickly, such as while attempting to avoid an object in the road. Serious injuries to the driver and occupants of a vehicle that rolls over may occur due to the extensive damage that usually happens to the vehicle. Multiple-car collisions. These types of accidents are usually associated with heavily traveled roadways in bad weather conditions, including snow, ice, heavy rain and fog, in which vehicles crash into each other after one or more drivers lose control of their vehicles. Fires and severe damage to the cars involved in the accident could cause severe injuries or the death of the drivers and occupants. Determining the cause of a serious car accident can be particularly challenging. Damaged vehicles and a cleared accident scene can complicate the gathering of evidence. Our trusted personal injury lawyers have the knowledge and skill needed to sift through the facts and circumstances of various car accident types. We work to identify the party or parties responsible for your injuries, including other drivers or government entities responsible for roadway maintenance. Sometimes, as in the case of rollover accidents, the design of a vehicle might be at fault in causing the accident, so a product liability claim might exist against the manufacturer of the car. At Larson Law Firm P.C., our compassionate team of lawyers is prepared to stand up to insurance company adjusters, making certain that the compensation you receive is the maximum to which you are entitled. Find out what our attorneys can do for you by calling us at 701-484-HURT to schedule a free consultation and case evaluation. You can also contact us through our contact form. We can schedule an appointment in our convenient Minot office location, and we also handle cases for car accident victims in Ward, Williams, McKenzie, Pierce and Mountrail Counties.